We, BND Engineers Private Limited, an ISO 9001:2008 certified company, established in 1994, are well-known manufacturers, suppliers and exporters of premium quality Compressor Parts and Heat Exchangers. Our range of products includes Compressor Parts, Compressor Valves and Cooled Heat Exchangers. Moreover, the products offered by us, are highly recognized among our prestigious clients for their extensive features like sturdy design, precision engineering, powerful performance, easy installation and durability. Following a professional approach, we have been able to carve a niche in industry with our perfect blend of expertise, resources, opportunities and marketing skills. We have a well-equipped state-of-the-art infrastructural unit that consists of all advanced technology based machines. Moreover, our production unit covers a vast area and is especially designed for manufacturing qualitative range of products in bulk quantities. As we lay great emphasis on the delivery of our products, a strict quality policy is followed by our quality auditors keeping in mind that every product must undergo rigorous quality checking on various parameters and technical aspects to maintain flawless quality. Along with this, our strong and coordinated supply chain system helps us to deliver products within promised time frame at the clients’ end. Owing to these infrastructural back up facilities, we are able to satisfy our large customer base that includes some distinguished industrial patrons like ONGC, BPCL, HPCL, BRPL, IOCL, SAIL, NTPC, NPCIL, Railways etc. We have been able to establish leading market position in this domain under the expert guidance of our director Mr. Ramnivas Mour. His in-depth knowledge and visionary guidance along with strategic decisions have helped us to find a new growth path for the company. We have our esteemed clients from all across the globe. Manufacturing and Trading of Air / Gas / Screw Compressor Parts for all reputed makes and Models such as Ingersoll Rand / Dresser Rand, Atlas Copco/CPT, KG Khosla / Kirloskar, BPCL / Nuovo Pignone. The company has a well-equipped sound infrastructural base that covers a vast area and has capacity for bulk production. It functions in a streamlined manner with the aid of latest technology based tools and machines like cutting, drilling & casting. Besides this, we have strategically installed all machineries for enabling a smooth production process. Moreover, we have a spacious warehousing unit that is able to store bulk quantities in a safe manner. We are one of the well known manufacturers and suppliers and exporter of Air Compressor Filters, Air / Gas Compressor Parts and Heat Exchangers. 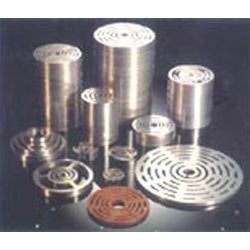 To manufacture these Compressor Spares and Accessories in accordance to defined quality standards, we use quality material procured from certified vendors. Our Compressor Parts are manufactured in various specifications to suit the demands of various segments including Petroleum Refinery, Power and Petrochemical Plants. Further, these are offered at market leading prices. We believe that our workforce is our strength and most valuable asset. Thereby, we hire a number of high skilled professionals who are experts in their specific domains. They continuously put in their best efforts into developing the most innovative and efficient product designs. Moreover, our professionals always have been focused on keeping themselves updated with the emerging market trends to meet the expectations of our clients. Owing to our dedicated and well-coordinated supply system, we are able to deliver products at clients’ premises. Since our establishment, we have been running our business with the sole aim of catering to client's satisfaction by offering them supreme quality products. Our products are useful for petroleum refineries, power and petrochemical plants. The company has a sound Research and Development unit to keep in line with the latest technological developments of the industry with the aid of team of skilled workforce, which enables us to provide customized solutions as per clients’ specifications. Our logistics professionals are engaged in providing timely shipment of the products to the clients based across various sectors.